Nothing brings in winter cheer like a happy dancing flame from your favourite candle, warming the chilling view outside from the seat at the table. What would winter be without candles and fairy lights? Many people cannot go without them, and now it has become even easier to get your hands on some perfect scents. With elaborate scent creations from the top candle makers in the world, good candles are no longer restricted to the top shelves of high-end department stores, coming into the high street and dominating the virtual shelves of online retailers. As festive interior inspirations go, there has been one of particular significance this year that has also affected the trends in candle-buying. This season ‘Hygge’, a Danish concept for creating a good ambience in the house through the use of lighting and general nest-making is going to dominate your interiors. Although the concept has been somewhat lost in translation outside of Denmark as the overarching fashionable interior design trend for this winter, its true meaning cannot be felt without candles. In Denmark, classic beeswax candles are preferred for their organic scent, however, I fancy the traditional ‘hygge’ candle blanket term could be altered slightly to include good quality scented candles. Generally, winter candles try and promote the very ‘cosy’ feeling that ‘hygge’ is embodying anyway. However, the scents leave a lot to be desired.The classic winter candle is filled with the smells of winter, cloves, baking and cinnamon. Reminding us of the childhood sweets give out as treats during the festive season, they bring to mind some of our best memories. Years away from our former childhood, more mature scents appeal to us. There is a step away from over-used (over-smelled!) scents and more interesting scents have been championed. These include some candles with notes of chestnut, fir, pine and fireside smoke all featuring in this year’s line-up. So without further ado, here is a lineup of my top five Christmas candles! 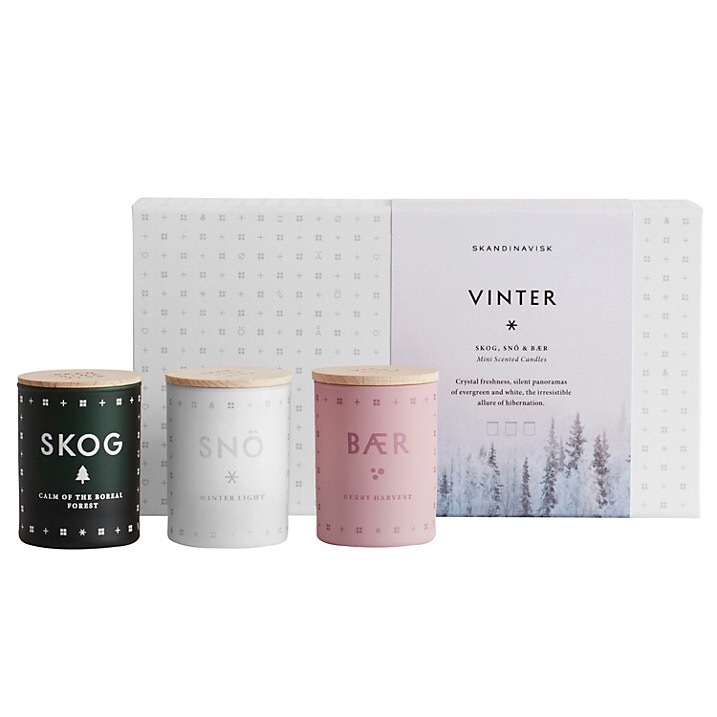 While this is a set, anyone buying into the ‘hygge’ trend should not be without some typically Scandi candles, and these ones smell of Scandinavian berries, the woodland and the light freshness of the lakes. Their simple packaging and calming colours evoke each of the scents- green for Boreal Forests, white for Winter Light and light pink for Berry Harvest. I first tried these in Liberty in London and they smelled amazing in full size, so having a selection of the company’s three best scents is truly not something to miss! 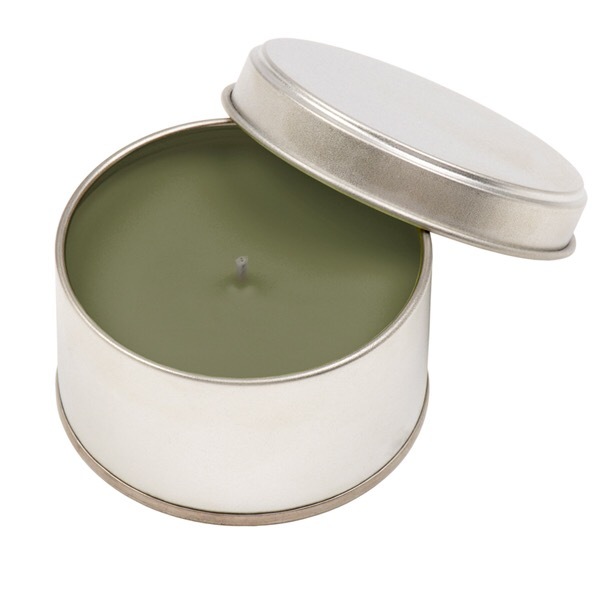 Boreal Forest smells like a light mix of floral and moss, Winter Light smells like frozen berries with a more light wood smell, and They burn brightly and are big enough to get you through the cold early months of the new year. Cheaper candles don’t have to be badly scented anymore! Monki is a great brand that regularly comes out with new scents for their home section, and this wonderful ginger one is a great addition for Christmas. It is in a regular size and for this price can easily be given out as a stocking filler. The light ginger scent doesn’t overpower the room, so this is a candle for those who like some spice but don’t want to include stronger spices like clove or cinnamon into the Christmas scent lineup. 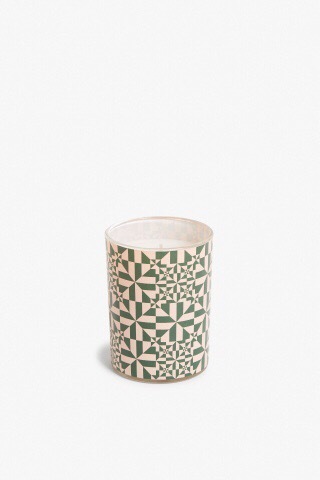 The pretty packaging in geometric shapes also slightly reminds me of a Scandi aesthetic, so that makes it a standout feature of this candle! 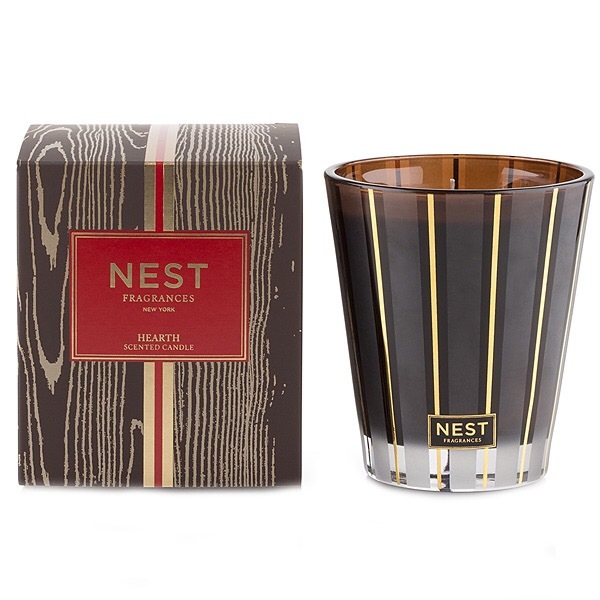 Nest candles are known for their wonderful scents and this one is no different! I always like scents that smell like a fireplace without the need to actually put logs on and light them and for me, this candle is the perfect replacement. This is also a definite stray away from typical winter candles as it does not contain any cinnamon scent. ‘Hearth’ is a cosy, pleasantly warm fragrance that lightly scents the room with Oud wood, frankincense and embers, which are always a good addition to any winter candle. The attractive wood grain candle packaging makes for a great gift and its striking gold and brown candle design adds warmth and luxury to any room. These two candles have been compared by other lifestyle bloggers in the past, and while I had been loving the Feu de Bois candle for a good couple of years now, I had not had the opportunity to try the MUJI Log Fire candle. As they are both supposed to evoke the scent of a good wood fire, they both tick the box for alternative winter scented candles. Having tried them both now, it is a definite to me that the Diptyque candle is superior in scent with a wider throw and a slightly warmer and more complex scent. Muji’s candle really does evoke a wood fire but it has a very small throw and the scent doesn’t linger quite as well as with the Diptyque. For gifting, the Diptyque candle is certainly a better fit, however, when your bank balance doesn’t quite allow for such an extravagant purchase, the MUJI candle will definitely suffice. 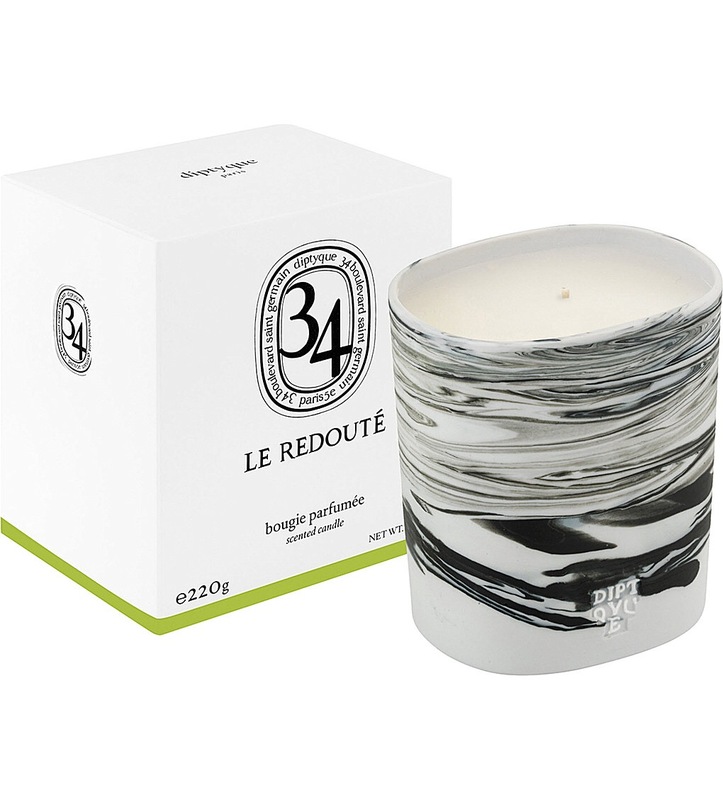 This candle exceeded my expectations when the ’34’ collection came out from Diptyque! 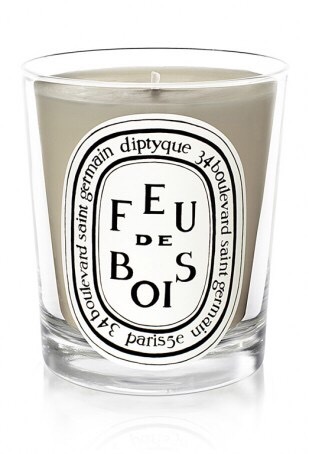 I may be biased to include two Diptyque candles into my top 5 but I have not found another winter candle that evokes that warm, spicy scent of the winter season that isn’t overdone by sweet, cloying scents. This makes me think of a herbal shop or an exotic boudoir, and the scent is not overdone. Roses, cedar and amber combine with more typical clove and cinnamon to combine into a scent that really does evoke the winter season with the warmth of a pleasant, gently warming scent.